My Great Aunty Barbara was born in 1922. The first world war had been and gone and she was the youngest of four. That’s Barbara, in front, rocking the headscarf. 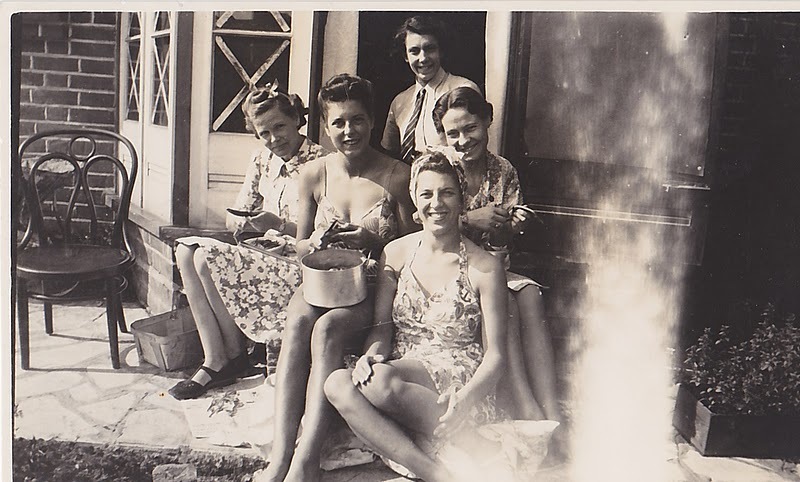 The lady wearing her swimming cossie and balancing a saucepan on her lap is my late grandmother, Billie. Barbara’s the only one still alive. 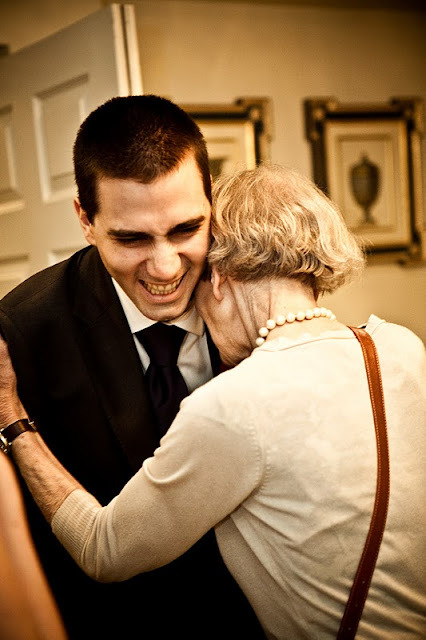 Since my grandmother, Barbara’s sister, the first love of my life, passed away seven years ago, Great Aunty Barbara is the family’s official matriarch. 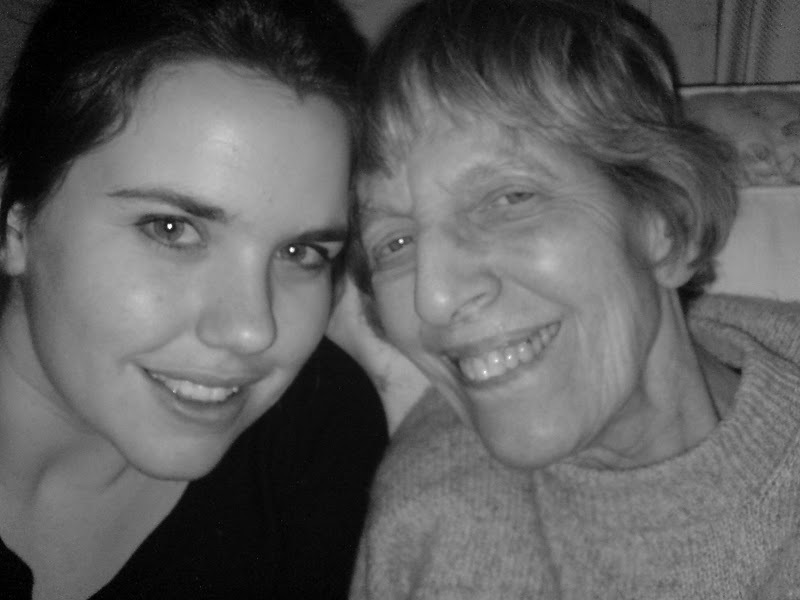 I thought Gran would live forever, and it turns out she didn’t, so Barbara is the only one I can get the stories from. And I do. I go and sit in her flat in North London, and have tea and ask her questions. Questions about her childhood, and her life, and her marriage. She gets frustrated sometimes. She doesn’t remember as much as she used to, and she sometimes gets irritated with me, asking me why I want to know so much. But her stories are no less compelling for the dubious chronology, or the blanks. Barbara came to my wedding. Afterwards, she asked me why I spent so much money on one day. She’s blunt, is Barbara. She has a point. But then, there’s always context, isn’t there? She got married in wartime, on 20 December 1941. 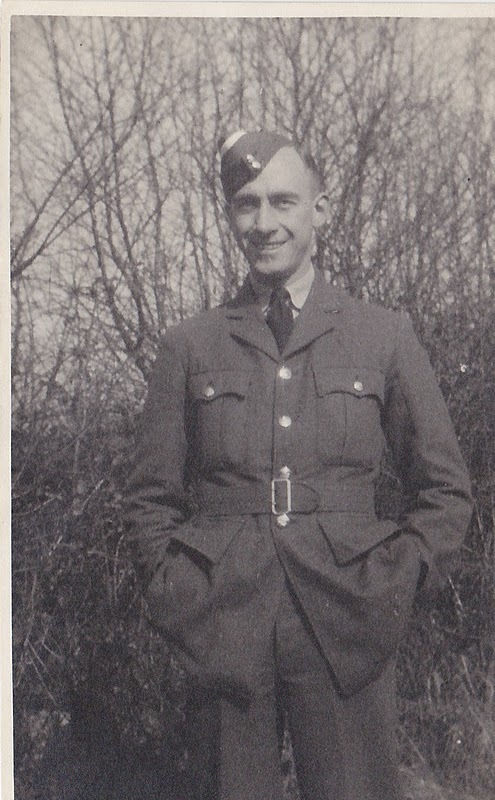 Dennis in his army uniform, shortly before his Canada posting. Barbara met Dennis when she was 19 years old. They were married for 63 years. They met when Bounds Green tube station was bombed. Barbara worked in the Post Office on the Euston Road and went home via Bounds Green, so they had to start taking the shuttle bus home from work instead of the tube. Dennis sat next to her in the bus. She thought that was forward. He offered her a licorice. She took it. He caught her when she jumped down onto the street from the shuttle bus. She thought “I like that he does that. He’s kind”. They started courting. Barbara lived at the very north end of the Piccadilly Line, and Dennis at the very south. Dennis would travel the 34 stops to see her, and the 34 stops back, every week. He first kissed her at the top of the hill of Prince Georges Avenue. They went on dates every Saturday night to see shows in the West End “Did you spend the week looking forward to your dates, Barbara?” “Yes, dear. But I also spent the week working hard and trying not to get bombed, and dealing with men coming back from the war. There wasn’t much time for mooning”. Barbara, on a rooftop in North London. Dennis asked Barbara to marry him one day in St James’s Park. He didn’t have a ring; in 1941 there was no chance of finding one. Barbara didn’t care. She didn’t even think about it. “What did you feel?” I asked. To paraphrase: “Anna, I said yes. He was right for me and it was the right thing to do. Young people today make such a song and dance about proposals and questions. It comes down to common sense. Can you imagine yourself with anyone else? Is he honest and loyal? Decision made”. I asked her about her wedding dress. She got the material cheap and took it to a seamstress on Upper Street, Angel. I actually have Barbara’s wedding dress in my wardrobe; she gave it to me last year. It’s a beauty, a classic 1940s number. When I held it black and white film images flashed through my mind. It doesn’t fit me, and sadly I’m not sure it ever will, but maybe my children will like it, one day. “Why wasn’t the dress white, Barbara?” I asked. She looked at me like I was an idiot. “It was wartime. Nothing was white”. The place in North London where they planned to marry was bombed. Barbara, as you may have guessed, wasn’t fazed. “It was only a wedding ceremony”, she said. “You can do it anywhere. None of that stately home faff”. They married on 20 December1941 in a Jewish hospital in North London. Their families didn’t attend, because they didn’t see the need. All they needed were two witnesses. The ceremony cost 7 and sixpence…which Dennis forgot to pay and they were promptly chased down the street by the registrar. “How did you feel?” I asked. I know…you’d have thought I’d have learned by now. They went to Barbara’s parents house and ate a sandwich and had a very small glass of port, because it was wartime and there was no wine or champagne available. They honeymooned in Copthorne, Sussex, at Dennis’s parents’ house. “What you don’t understand Anna, is that the war overrode everything. I see weddings now, I see all these girls in their finery, and I don’t think I’d have done anything differently”. When I thought about writing this post, I was convinced I’d find a wartime love story to tell you all. I suppose that’s what I did find. It’s just not the story I had in my head. What I did realise is this; women have been getting married for a long long time. Barbara’s story is one of thousands and thousands. There is symbolism and tradition that has become entwined around the concept of a wedding, but you could take it all away and it would mean exactly the same thing. We are lucky to live in peacetime, to be affluent enough to afford a dress, any dress, to throw a party for our friends and family, to pay to have someone document that day forever. We care about rings, we care about how we look, we care about what our choices say to the world. Somewhere along the line, weddings became something that must represent us, validate us, say to the world “this is the kind of marriage my partner and I want, this is who we are”. If it’s all about the marriage, then when did that happen? If weddings were just words in a room, no ring, no aisle, no white, no party…would we still want them as much? If your wedding was something you could barely remember after a year, because there were simply more important things going on…like a war…would you care? Barbara didn’t have her day her way. She didn’t give a monkey’s. She didn’t feel a failure for it. Women for milennia haven’t had their day their way. They, after all, just got married. As much as I know anyone who writes for and reads this blog had or hopes for a day full of happiness and love….it makes me question the almost inauthenticity of what weddings have become. Not the feelings. I don’t doubt those. But the institution around the feelings. We all know the marriage is more important than the wedding. We wouldn’t be reading this blog if we didn’t. But we still use our weddings as a hell of a propaganda tool. Me included. Barbara and my husband at our wedding. Alright, it was pricey…but you liked the canapes, didn’t you Aunty B? Oh! How I loved this post! Made me think of my sweet Gran who was not only the first love of my life but my hero. She and Barbara would be the same generation, I think! Maybe they knew each other since my Gran worked as a nurse as well though she moved to India just before the war broke out. An English woman decided to marry a Sikh gentleman and then proceeded to travel the seven seas and live in a completely foreign country. Imagine that! Their generation was made of different stuff. This post made me feel close to my Gran so I thank you for that. 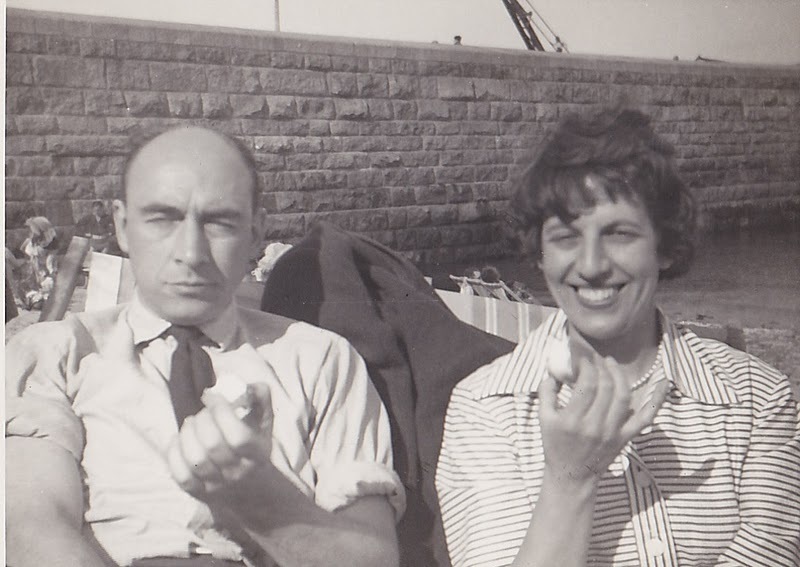 One of my grannys eloped on a slowboat to Egypt in the 1930s, my mum was born in Cairo! This has made me cry on the bus- not a good look! 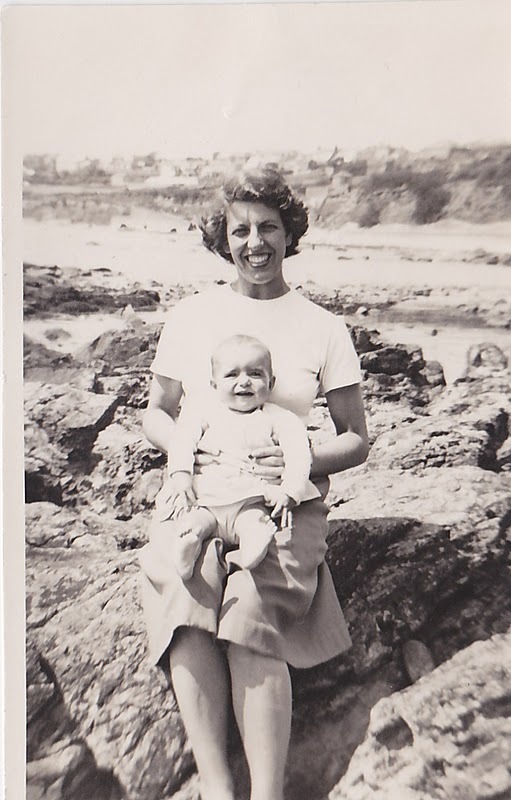 My beloved Nana, who passed away in 2008, was also a wartime bride and was also very matter of fact about the long separations and difficulties that were just a fact of life. In the last weeks of her life, we talked a lot about the 'old days' and also about the various stages of life me and my siblings/cousins were at- I told her that I often felt like we were spoilt for choice now, with the freedom to do pretty much whatever we wanted. Her response? 'Then it was all worth it'. I try to remember this as often as possible – it's so easy to forget that not every generation is lucky enough to be able to worry about their wedding/career/life in general. And Anna – please may I borrow your Auntie? I promise to bring cake and not ask too many questions! what an amazing love story. I do believe that weddings have got way out of control these days the amount of money that is spent is ridiculous. I have friends who are trying to plan their weddings now and neither of them wants a huge extravagant wedding but are finding it near impossible to find anything to fit their budgets. My parents got married when they were 18 it was a simple wedding they had no wedding reception and were married at 11am in the morning, my mum wore a white lace mini dress and platform shoes and my dad wore a suit with cuban heeled shoes and very long hair! they have been married for 40 years and still love each other dearly. If a big huge wedding is what you want then thats totally fine but if you don't then thats totally fine too. Ps make that 2 people you've got crying on the bus this morn. Beautiful post. I love that you told us how Barbara met Dennis, and their devotion to each other. The photos are fab too. I love this, Anna, thanks so much for sharing. She sounds like an amazing woman to have in your life. Aunty Barbara is officially my new hero! What. A. Woman! And I love how matter of fact she is about weddings, marriage, even the war. Please count me as the 3rd person in to want to have cake and tea with her. On my parents side, both my grandparents had arranged marriages and they never really spoke about them to me. But on Martin's side, his Granny Marjorie, now she's got some stories! And she married his late Grandad during wartime. Think she wore a blue suit. I will have to visit her soon and get all the details. Anna, thanks so much for posting this. Its given me some well needed perspective this morning. Good Morning Anna, thanks so much for writing this! Really fantastic story and what a cracker of a woman Barbera sounds! My Grandparents all passed away before I was 16 so I always feel that I missed out on such tales. Wish I had thought to ask stories at the time. One of my maternal Gran's sisters is still with us however and I think I may now have to arrange a cake and tea visit for some wedding stories! You've made me realise that although my Gran may not be around, I can still learn about her life from those she lived it with. Nice realisation for a Wednesday morning, thanks! Thank heaven for Aunty Barbara, that's all I can say. 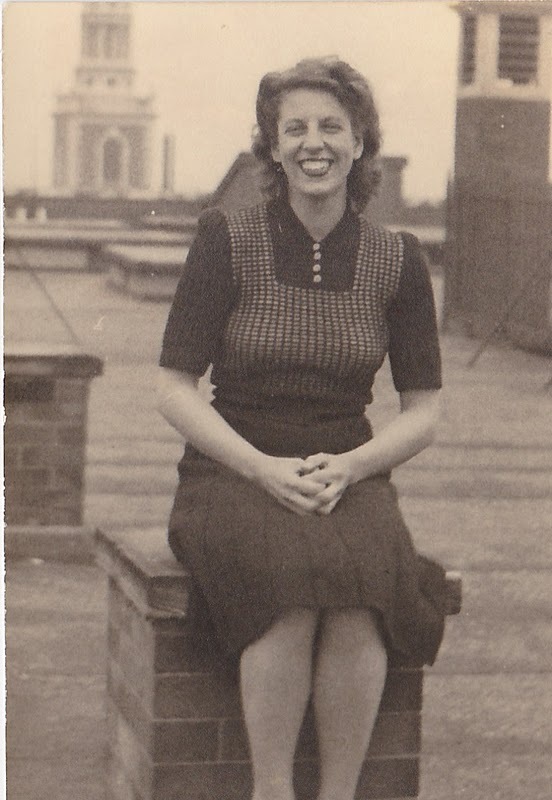 In trying to keep myself sane at the moment I often think of my Grandma and the way her life was, coming from another country and seeing the war. She was IMPOSSIBLE to get stories out of though, so frustrating. We don't realise how fortunate we are in having a choice about whether we have a big wedding or a modest affair. Being able to express ourselves through our taste is a luxury earned for us by those who struggled before us…. This is such a great post that just exemplifies everything that AOW stands for, and serves as a great reminder of what IS important. I'm pretty sure that ALL of us have had or will be having a bigger wedding than Barbara did, and that's fine. But the point is to remember that that is our choice, and that we are incredibly lucky to have that choice, because of people like Barbara and her husband. But my favourite line of all? "It comes down to common sense. Can you imagine yourself with anyone else? Is he honest and loyal? Decision made"
- what a perfect way to describe it. And makes me know I picked right. My grandparents will have been married for 60 years next week *telegram from the queen time*! They have countless stories about when my dad and his brothers were growing up, when me, my sister and my cousins were little, and even when my grandad was in the army. But I've never heard them speak about their wedding. Obviously it was just a tiny speck in a huge vast marriage, probably the way it should be. Oh Ladies I am so delighted you enjoyed this! It was a bit of a risk, so i'm glad it's paid off. Great Aunty Barbara would LOVE to meet you all. I bet she'd like to hold court! Favourite quote in the comments so far: "Obviously [the wedding] was just a tiny speck in a huge vast marriage, probably the way it should be." L, you are so right. And Belinda and Kismet…WHAT stories you ahve in your families…the stuff of novels, methinks! I officially love Auntie Barbara. And she's so right, I can't make myself care very much about my wedding stationary, or my favours, or my flowers. Of course I'm getting them organised, very cheaply, nonetheless (and hopefully they'll be terribly pretty on the day, no thanks to my creative mind!) but feel like a bit of a wedding failure sometimes, when I look at blogs online. Thank you for such a wonderful post, Anna. For reminding me it's okay to only REALLY care about standing up and marrying the best man I will ever know. "Did you spend the week looking forward to your dates, Barbara?" "Yes, dear. But I also spent the week working hard and trying not to get bombed, and dealing with men coming back from the war. There wasn't much time for mooning". Best thing I've read in a long, long time. Barbara is my new heroin – you're lucky to have someone to keep you so grounded Anna! Also, fantastic post – I giggled my heart out and had tears in my eyes at the end with those photos. AOW ladies, and Rebecca yesterday the last three posts have been so thought provoking and personal thank you. Monday's post made me consider the similarity between weddings & funerals too. Rebecca's – and what do we do about our young boys and all they see and expereince. Today's – Remembering my grandparents and an Irish Catholic girl falling in love and marrying an East End Jewish boy in 1939. On a lighter note my grandfather woo'd by grandmother with KitKat bars. Anna this was in no way a risk! It was fab in every way. I have a great aunty Barb too, and now I'm going to write home for her story!! Thanks for brightening Wednesday morning. Great post Anna. I reminded me of when, a couple of weeks before we got married, I read a really nice interview in our local paper about a couple who had been married 60 years. When asked about the secret of their long marriage the wife answered "He brings me a cup of tea and a biscuit in bed every day – I've told him not to bother, but he says it would put him out of his routine" The husband said: "It's been a great marriage – she's been no trouble at all". How lush?! Your Great Aunty Barbara sounds exactly like my Nanna!! To the point and always brutally honest. Thank you for the perspective, Anna. It's so easy to dwell on the day itself rather than the marriage ahead of you. I think if we all admitted it, there will be something about everyone's big day that wasn't 'perfect'… but so what? It's just one day, and you have the whole of the rest of your lives together to look forward to. Aunt Barb should have her own regular column. How refreshing it is to hear this story. I know the whole fairytale wedding and the consequent backlash in the form of alternative non cookie cutter weddings is a relatively new thing in the history of weddings, but seriously I still think we've got a long way to go before women really have the balls to go all out into wedding planning with more of a 1941 attitude. So much pressure on weddings now. Personally I can't imagine anything I'd like more than to photograph a wedding like this. It obviously brings to mind elopements, but an elopement doesn't tend to be on your doorstep and usually has some element of surprise. To see a wedding of two adults saying yes to vows and no to stuff they don't need/ want or have…that's beautiful. Katie here (again). On computer where I ought to be doing the book keeping, but needing a break. Arrggh. Missing receipts are driving me potty, and I really ought to go home, but can't till I've done this VAT return. Argggh again. Sounds amazing katie, we thought about doing the same, just running up to our village church wearing nice clothes with a couple if witnesses. So romantic. I guess a big part of me still dreams about it! Awesome awesome stories and agree that you are spoiling us with the posts! I have no longer got any grandparents but have plenty of older patients who LOVE to share their stories and love stories. Married for up to 70 years some of them, it makes me skip! "Nobody is perfect. Nobody is ever right all the time. Apart from the wife. She is always right. Oh and manners are always important. She clouts me if I forget me manners". Married for 68 years peeps…I heart him. And thank you, readers. Your wisdom and insight and general wonderfulness is making AOW a rather special place to be and we LOVE you for it. Ah, now this is RIDICULOUSLY good. Thank god I found AOW, and especially this post. I was getting lost in a sea of competitive DIY-detail! I feel so fortunate to live in a time and a place where we have the luxury of a wedding day that 'really expresses who we are'. But I can't help feeling that the very sensible aim of not following tradition just for the hell of it has morphed into an excess of batshit-crazy individualism. I live in Argentina and here, middle class weddings are pretty much all the same (church, then a party in the equivalent of the country house with lots and lots of food and guests but absolutely none of the individual touches we all get so obsessed with). It's all about dancing til five in the morning and having pizza before you head home, happy, knackered and only mildly drunk. I'm hoping to bring elements of both countries' approaches into our parties, but in the end, although I'm excited about buying a dress and occasionally get sidetracked by the ideal table plan, I know it's just frippery, and that a cool wedding day will not make a cool, or even an interesting person. Marrying my extraordinary boyfriend and nurturing our relationship every single day is the point of everything we're doing and spending. The thing we're blowing the budget on is doing it twice, because that's the only way we will get to celebrate with all our friends. That's an amazing privilege, when you consider wartime brides like Barbara who felt lucky if they got to have a sandwich with the new in laws. Thanks, AOW people, for restoring my faith in sane sensible brides with a sense of humour. I think this fantastic post has finally put paid to my fussing about the table plan. Helen, you have completely made my morning. I hope you enjoy looking through some of our older posts, and I especially hope you comment some more! Thanks for the lovely welcome, Anna! I have been roaming around a bit and finding all sorts of great posts and feeling very inspired. I love your reading list. The Master and Margarita is just the best. I have never felt very comfortable commenting on blogs, it all seems scarily public to me, but I can totally see the benefit with AOW. There some very cool women writing and commenting on here! Thanks again. I loved this, found while trying to undersand a memento in my (just deceased) uncle’s house. It’s 7 half pennies from the year he married my aunt (1941), fixed, in a pattern, onto the top of a old salmon tin. In fact, now we’ve looked closely, it’s Alaska salmon, which is clever, as they were Mr and Mrs salmon, and my aunt’s maiden name was Seward, as in Seward island, Alaska! We found the coaster with a framed wedding photo and a sampler I made to celebrate their diamond wedding anniversary. Obviously someone put some thought and effort into this coaster as a gift, but we’re puzzled by the thruppence ha’penny – cost of the licence? no , it seems that was 7/6. So what? any ideas? Incidentally, I agree that we spend too much on the dream wedding. My husband and I married after 20 years together, and only because he was seriously ill and if jsut felt right. We only told our two witnesses, chosen carefully as we knew we cold trust them to keep it quiet. Only got the special license the day before, and got a cancellation at the registry office. Went there and back by bus, had lunch in a local caff. It was a lovely day and I was surprised how significant it was in the weeks after while my beloved was in hospital. I suppose I shouldn’t criticise others, but I really do question the priorities when I see the expense and extravagence of some. Oh dear, feel I must be getting old and grouchy!